Thanks to the cloud synchronization of your File Storage, all files are synchronized on all of your devices. 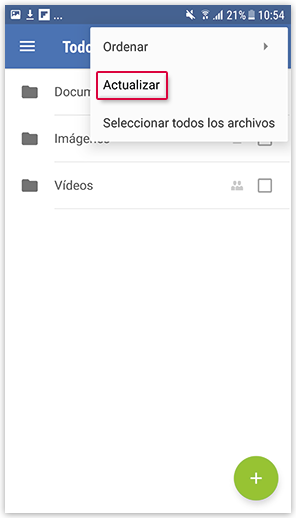 Refresh the folder overview in your app to see changes immediately. Requirements: You need an active internet connection to synchronize your GMX File Storage App for Android. Tap the ⋮ symbol in the menu bar while you are in a certain folder and then tap Refresh. Pull the folder list downwards with your finger and then let go. You have refreshed your folder. The app was synchronized with your File Storage.